Earlier last week I had one of those days. My heart felt broken, my eyes could not stay awake and no amount of caffeine could break me from my slump. As the day went on, the jingle of a popular blue box of macaroni and cheese came into my head. With the words, ” I’ve got the blues” playing in my head, I began craving a rich, indulgent cure for my heartache. Rather than succumbing to the blue box, I searched through my food blogs to find a recipe that would distract me long enough in the kitchen. Once I stumbled upon White on Rice Couple’s One Pot, Stove Top Macaroni and Cheese I knew I had found a remedy. Because the recipe requires constant attention, it was just the thing I needed to help clear my focus. Not only does it use only one pot, but also the lack of baking means it can be enjoyed on even the hottest summer days. The recipe is also flexible enough so that it can be prepared with various combinations of cheeses. Despite the popular slogan of that specific macaroni and cheese box, making the dish from scratch on the stovetop is an easy, satisfying prescription for the blues. I used whole grain shell pasta for this recipe, but you can easily substitute any type of large elbow macaroni. Place raw macaroni in colander and quickly rinse under water. Let drain. In a medium saucepan, about 2 quart, melt butter over medium heat and add diced onion. Sauté until translucent, about 3 minutes. Add milk, raw, rinsed macaroni, salt and pepper. 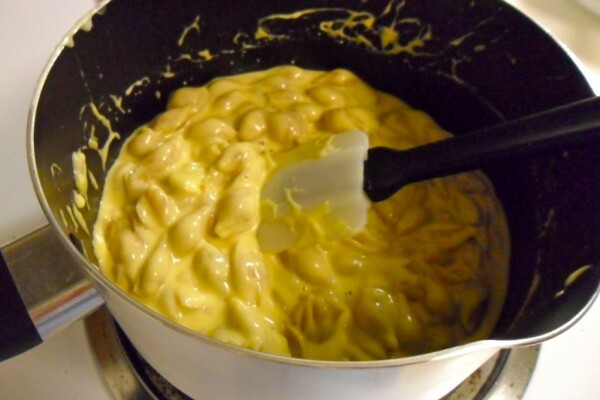 On medium heat, slowly bring mixture to a simmer, stirring the macaroni frequently. Stirring will separate the pasta and keep them from sticking to one another. Do not leave the stove; leaving the mixture unattended could result in an over-boiled mess. Once mixture comes to a simmer, immediately turn heat down between medium and low. Too-high heat will evaporate the milk too quickly. Continue to stir the mixture frequently for about 15-20 minutes, or until milk has been fully absorbed and pasta is cooked al dente. Judge to taste. If pasta is not fully cooked after this time, add a little more milk or water to the mixture. Liquid amount will depend on how much longer pasta needs to cook. When milk has nearly evaporated and thickened, stir in cheese. Turn off the heat and allow cheese to melt into the mixture. Add additional salt to taste. Before serving, stir one final time to mix everything together. Categories: Campus Cooking, Eating, Featured, and Recipes. Mealtime: Dinner and Late Night. I Don't Have Any: Money. I'm Cooking For...: Easy Dinner, Late Night Snack, Myself, and Potluck. Type of Food: Pasta, Vegetarian, and Vegetarian Main. DO NOT let the milk go beyond a light simmer, otherwise your mac will be grainy. And this milk amount is PERFECT. Adding more results in a soupy gloppy mess. OMG! Look up the microwave version!!! LOL!